At this year’s IBA show, MECATHERM, a global leader in automated production lines for the industrial bakery sector, launches three major innovations, including the M-NS, a divider which employs the latest innovative technology to enable industrial bakers to produce crusty bread of the highest quality. 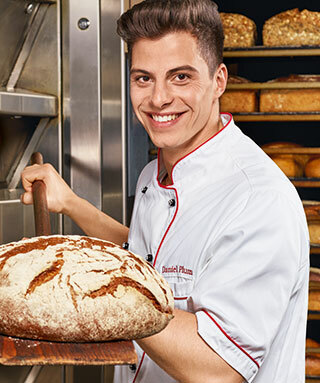 As consumer preferences change, and pressure from competitors increases, industrial bakeries need equipment which meets not only their expectations in terms of industrial performance, but also the product quality requirements dictated by end consumers. For more than 50 years, MECATHERM has been renowned for its expertise in the crusty bread production sector. With this new divider, the line industrialist is providing industrial bakeries with a solution for improving the quality of their production of baguettes and baguette-related items. This new system, patented by MECATHERM, not only brings real added value to the quality of finished products, it also offers industrial bakeries multiple advantages in terms of performance and profitability. The result of a meticulous Research and Development process, the new divider is a system which combines the advantages of volumetric and laminating dividing. It provides industrial bakeries with an expert, precise solution which is easy to use, and which can help them to easily upgrade their production to include traditional baguettes, bringing them closer in line with current demand from consumers. Until now, industrial bakeries had to choose either a volumetric divider or a laminating divider. These two systems are very different, with each offering distinct advantages and disadvantages. The volumetric system has costs benefits, is compact, and can ensure the accurate weights valued by industrial bakeries; however, it does not allow high hydration or prefermented doughs to be divided. Laminating systems can overcome the latter obstacle, allowing very sticky doughs to be worked. But these lines are long and costly, and are unable to manage variations in the density of the dough effectively; they also generate significant quantities of trims and consume large amounts of flour throughout the process. Furthermore, in both cases, it is necessary to apply high pressure to the dough to create a regular shape and enable an acceptable level of weight regularity to be achieved. This divider produces pieces of dough which do not hold tension which could subsequently disrupt the shaping or proving stages in a pan, faithfully reproducing the process employed by the artisan baker. The combination of these pieces of dough with no initial tension, and a final shaping process which works the dough in the correct way, ensures the end product has improved spring in the oven, with a crust which is thin but not dry, and a light and airy crumb: the authentic French baguette. M-NS does not need a shaper, laminating rollers or a multi-roller. Once the dough has been centred and the base of the dough secured by the station, the dividing process can start. The dough pieces are cut, separated and checked (and ejected if their weight does not match the set target): they pass through a scaling station, are cut with the accompanying guillotine, weighed and the density is calculated, all at a very high frequency. The dough pieces divided with this system are stable in weight, regardless of the dough's density. This density is actually liable to continuously vary over time as the kneading tanks are emptied, or when there are micro-stoppages along the line. The dough does not therefore undergo any stress or stretch, with no trims, and no excess flour. This compact new equipment combines the previous techniques, with the end result designed to create an authentic baguette. M-NS is incredibly simple to use. Thanks to the machine's automatic settings, less time and less labour need to be employed. The machine is run from a screen, into which the operator enters two values: the target weight and the tolerance for the weight error margin. The divider manages the rest, and self-adjusts if there is a drift. Similarly, access is very easy, and cleaning has been made simple. The new divider from MECATHERM has been certified by the EHEDG (European Hygienic Engineering and Design Group), which guarantees that the equipment is easy to clean and that it complies with the strict hygienic design criteria set by EHEDG. The machine has been carefully designed to prevent any retention areas. It is largely self-cleaning, thanks to a system of scrapers underneath the belt which remove the dough scraps in the pans. This means that cleaning operations are reduced to one hour, and require just one operator. The new MECATHERM divider boasts another non-negotiable benefit for industrial bakeries: it enables a significant reduction in consumables. The equipment actually requires 1 % less flour and 0.1% less oil, and between 2 and 3 times less flour than a laminating divider and 2 to 3 times less oil than a volumetric divider. The new MECATHERM divider is a retrofittable solution, which can be installed in any production line in place of a volumetric divider or laminating divider. It has a smaller footprint than a laminating divider, meaning that the industrial bakery can install it on its production line, whatever type of first generation divider their equipment currently includes. MECATHERM is therefore able to provide a turnkey solution to customers wishing to upgrade their production tool to shift production towards traditional baguettes. Empfänger auswählen ...MECATHERMCommunication manager Ophélie Caron Bitte wählen Sie einen Empfänger aus.